Our dedicated catering team prepares all meals on site using fresh, seasonal and locally sourced ingredients. The varied daily menu is specifically tailored to suit individual’s dietary needs and always includes fresh fruit and vegetables. We seek feedback from our residents through regular food surveys, enabling us to continuously improve meal times and incorporate any special requests. 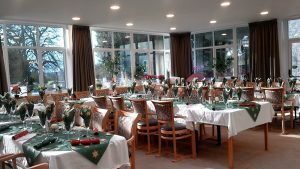 Residents can choose where they would like to enjoy their meals, they may choose to eat in their rooms or enjoy a meal with company in one of the dining areas. Fresh fruit, drinks and snacks are readily available to residents through the day so there is no need to worry about feeling peckish inbetween meals.